Some sticks are just not made to become crochet hooks. Take this example. 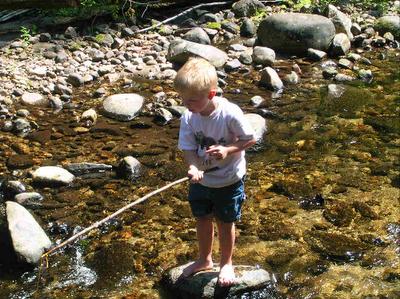 My Grandson Clinton decided that this particular stick would much better serve as a fishing pole. And later it became a marshmallow stick. Ah destiny! And, to all of you, a heartfelt thank you for your support during this trying time. Your kindness and warm thoughts following my Brother in law's passing are very appreciated. So onward! This weekend we'll be on our way up to the Crick!! A bunch of friends and relatives will be going up too. I might get a chance to do some whittling if not work on the trailer or cabin. Weather's been hot up there and we've not been able to go for any length of time especially since Howie's death. But we're going for a day or so and i'm soooo looking forward to it. Say......I've noticed that there have been no bids whatsoever on the Tunisian hook in the post below, and I'm wondering why. Maybe nobody wants a Tunisian hook? Or is it made wrong? Too big?? Too long?? Ugly??? Anyone care to comment? I'll be making more hooks now, to fill orders, but i'll try to get another one up here for bids too. It'll be just an ordinary run of the mill Jimbo hook... not a Tunisian. Hopefully one that will get some bids. So thanks again everyone for your patience and kindness. You're the BEST! Glad to see you back, Jimbo. Hope y'all manage to have a decent time up at the crick. Take care. Have a fun relaxing rejuvenating trip to you crick. I love the hook up for bid but have not the funds to make a bid so will have to pass on that one. I am sure someone will bid soon though. We are so very sorry about Karol losing her brother, it must have taken a lot out of her, but with your positive thinking & help, I'm sure Karol will be fine, & so will you. You know, going up to the crick will be a great way to just relax & take it easy, all of you need it. My sympathies for the loss of your brother-in-law. The tunisian hook in your post from the 19th of June is beautiful, by the way. Looks like it would be warm to the touch. But I thought it was already taken? Hang in there Jimbo! I'm glad you're back and getting ready to begin whittling away. My thoughts and prayers are with you and yours.